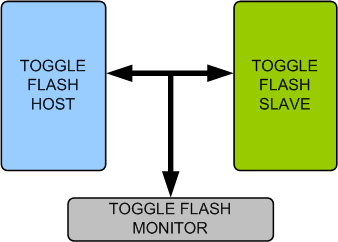 Toggle Flash provides an smart way to verify the Toggle Flash host controller or Toggle Flash memory model of a SOC or a ASIC. The SmartDV's Toggle Flash is fully compliant with standard Toggle Flash Specification and provides the following features. Compliant with Toggle Flash JESD230/ JESD230A/ JESD230B/ JESD230C/ JESD230D-Proposal specifications. Supports SDR, Synchronous DDR, NV-DDR2 and Toggle-mode DDR data interface. Supports all mandatory and optional commands. Supports 16 bit bus width operations. Supports Synchronous reset and Reset LUN commands. Supports Random Data Out commands. Supports Get features and Set features commands. Configurable speed grades for all data interface. Source Synchronous data interface supports Clock Stop feature. Supports Small Data Move command for both Program and Copy back operations. Rich set of configuration parameters to control Toggle Flash functionality. Protocol checker fully compliant with Toggle Flash Specification with versions JESD230/ JESD230A/ JESD230B/ JESD230C/ JESD230D-Proposal. Callbacks in host, slave and monitor for user processing of data. Toggle Flash Verification IP comes with complete test suite to test every feature of Toggle Flash specification. Models, detects and notifies the test bench of significant events such as transactions, warnings, timing and protocol violations. Faster testbench development and more complete verification of Toggle Flash designs. Easy to use command interface simplifies testbench control and configuration of Host and Slave. SmartDV's Toggle Flash Verification env contains following. Complete regression suite containing all the Toggle Flash testcases. Examples showing how to connect various components, and usage of Host, Slave and Monitor.